Exterior of house, showing patio's fence and upper deck. Living room with open beamed ceiling. Upstairs den beneath open beamed ceiling, with doorway to deck. STILL AVAILABLE: August 4 to September 4 (32 days) at $9,000, omitting the short-term lodging tax. 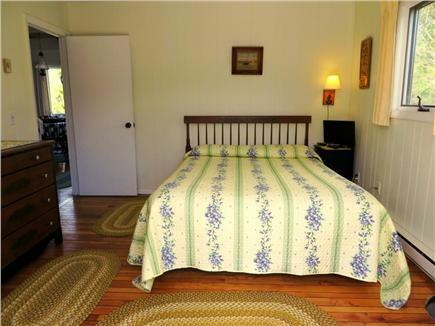 Saltbox style house situated in Lookout Bluff, on a private paved street. Cheerful, bright interior of 1,400 square feet. 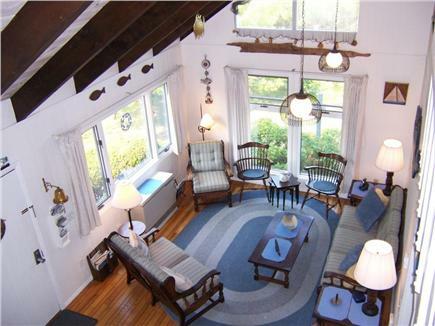 Vaulted ceilings, with skylight and ceiling fan. Hardwood floors. Nautical decor, with Hitchcock furniture. Well insulated, with gas and electric heat. Fenced-in patio, offering secure play space for younger children, and privacy for sunbathing, picnics, and cookouts. FIRST FLOOR: Casual living room. Dining area, with round or expanded oval table, seating 4 to 6. 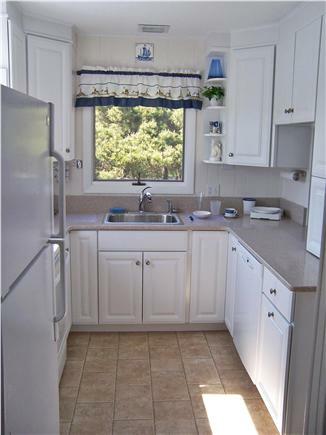 Kitchen, with refrigerator, stove, microwave oven, dishwasher, toaster, coffee maker, dishes and utensils. Queen bedroom. Twin bedroom. Bathroom with stall shower. SECOND FLOOR: Twin bedroom. Bathroom with tub and shower. 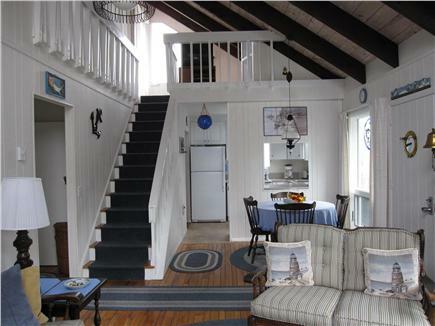 Den and upper deck, offering view of magnificent sunsets above Cape Cod Bay. SANDY BEACH ON CAPE COD BAY: Short walk to the Lookout Bluff Property Owners Association's beach. From the stairway at the top of the 50 foot bluff, there is an awesome view of the coastline from Wellfleet to Provincetown. 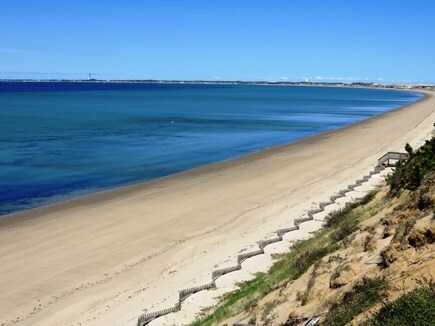 The beach is highly suitable for waterside walks, sunbathing, swimming, and fishing. Cape Cod Bay's water is warm from late spring into early fall. It is feasible to enjoy wading and clamming during low tide. 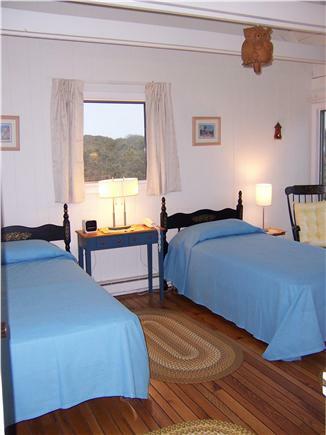 Nearby activities include: Golf, tennis, biking, sport fishing, surf casting, boating, surfing, sailing, parasailing, windsurfing, kayaking, scuba diving, health club, dune tours, dolphin & whale watching, beachcombing, hiking, guided walks in national seashore, birdwatching, antiquing, winery tour, lighthouse tour, museums, galleries, movies, concerts, live theaters, arts & crafts classes, and Puma playground for kids. 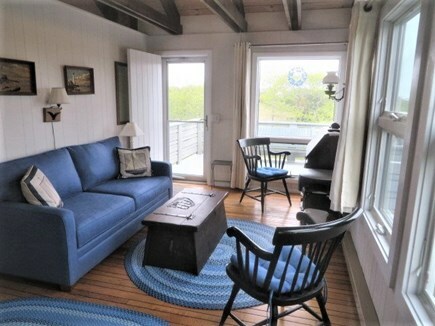 Provincetown also offers alluring shops, fine restaurants, friendly bars, and lively nightlife. Additional pricing info: $300 security/damage deposit. State and local taxes of 12.45% will apply. 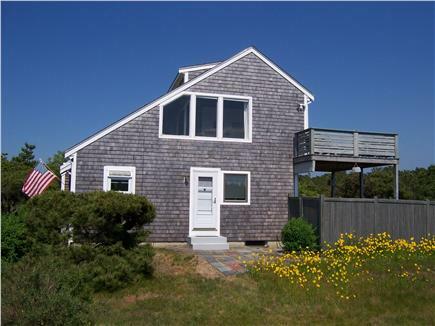 Excellent Cape Cod vacation home. 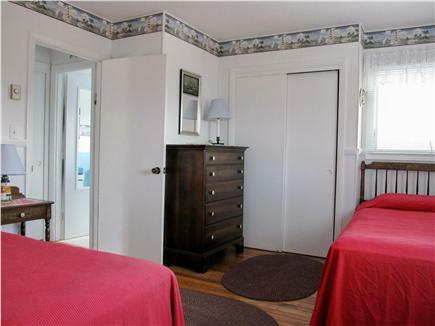 Very clean, tastefully decorated with a well equipped kitchen. Home is located in a nice, quiet neighborhood with an easy walk to a lovely bay beach and just a short drive to National Seashore beaches. Would highly recommend this home to anyone looking for a nice, family friendly vacation; can’t wait to return! We thoroughly enjoyed our stay at Jim's place! The location is amazing - 4 minute walk to the beach and a 4 minute walk to the wonderful restaurant Terra Luna. P'town and National Seashore beaches were easily accessible as well. The house was extremely clean, well put together and comfortable. We loved our stay and would most definitely return! Jim is a retired college professor. My family has vacationed on the Cape for many decades. We have owned this house for 40+ years. During the early years when there were very few homes or trees in Truro, our house had extensive views of Cape Cod Bay, including a distant view of Provincetown harbor. The light atop Highland lighthouse also flashed in the upstairs bedroom window at night. Today, pines and oaks are abundant, providing greater privacy while blocking distant views. 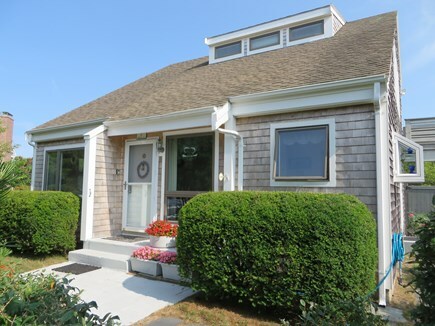 Lookout Bluff homeowners share a waterfront lot and beach on Cape Cod Bay with magnificent sunsets.